Callinspector – Callinspector functions by analyzing electronic invoices for cell and land-lines (manually entered by the user) and offering information on the company’s phone expenses. The program offers optimization suggestions on certain items and potential savings for businesses, interested in managing and simplifying their phone bills. Excalibur – Geared around protecting internet users from potential hackers, the draw of this startup’s seems to be the ability to log in by scanning a QR-code and entering a PIN sent via an SMS. In Germany screen scanners are already deployed, but an SMS offers yet another security layer. Instando – Citing an impressive list of users (which include Telefonica, O2, Google, and TEDx), this site seeks to ease the process of making conference calls. Unique features include the ability to submit question and to upvote the most popular ones. This site remains in private beta for the time being. LiveAgent – This startup solves one of the main problems with working in customer support, by offering companies centralized access to their various accounts. Through LiveAgent, clients are able to simultaneously handle Twitter and Facebook messages, emails, calls. Perhaps most interesting about this service is the feature that enables customers to evaluate the quality of support they received from their particular support-technician. Hardly a startup though, rather an up and coming player which claims to have pioneered certain features later introduced by its Scandinavian competitor Zendesk. Synapso – Synapso’s goal is to simply the process of creating a website. Their service will enable clients to quickly set up sites and then to easily manage content by dragging and dropping text or images, re-sizing pictures, etc. Also, the service offers clients the ability to manage content with their tablets and phones, which is useful for those who can’t always be near a desk. Unfortunately Synapso enters a pretty busy web builder space, but tablet and smart-phone based management may come handy. Myspectral – This non-profit organization aims to smooth the process of measuring UV/VIS/IR spectrum enabling customers to buy their own spectrophotometer for domestic use. According to their entry in the Pioneers Festival, application of this product in the project A*Space can simplify the process of testing for urinary-tract infections by allowing for in-home diagnoses and simply emailing or texting the results to the local physician. The company believes that this will solve the problem of the hassle involved with visiting a physician for the same test. geneton – Geneton operates by offering DNA-testing services. According to their site, they perform paternity tests, DNA tests, and various prognostic tests. GoldenFish Lighting – Controlling light dimmers and plugs by phone is an intriguing and, frankly, very practical concept, but this startup may suffer because competition in this area may become quite fierce. Electronics-giant Philips, Insteon, and LIFX have all latched on to the idea of connecting mobile devices with lights and overcoming the advantages that a company such as Philips may have will not be easy, but the CEO and founder of GoldenFish Lighting Tomas Baran sees a partner rather than a competition. GoldenFish declares that its will offer its light dimmers Beta at the lowest possible price, so maybe it can create an advantage in terms of price. This service is still in beta, but light dimmers can currently be pre-ordered. Asana – Chairs may have been with us in one form or another for millennia, but Asana believes that there can yet be improvements made to this age-old piece of furniture. It has created a chair which purports to eliminate lower-back pain by shifting body weight and allowing the user to sit in a more comfortable position. Not to be mixed up with the team task management tool. boARd – Per the company’s, this startup aspires to change the way that you play games with your friends. Reading this company’s site, it’s clear that they wish to really take advantage of augemented-reality technology to make for a more interactive and fun gaming experience. Watching a tutorial video, it seems as though this technology has real potential. There is a physical map (laid out on a table in the video) and the iPad’s camera allows the user to “enter” the world of the physical map. It’s still early stages for this company, but the video is at least intriguing. 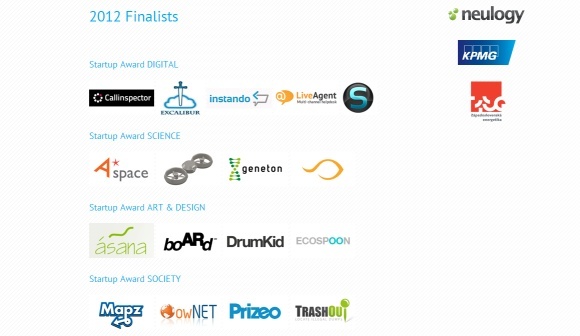 DrumKid – since this is an art and design section, the nominee is a app, web and graphic design firm. EcoSpoon – As the name suggests, this company aims to produce more environmentally-friendly spoons. The idea is that they’ve managed to create a utensil which functions as a spoon, but can can separate into a fork and knife. Another of advantage of this utensil is the fact that the materials to be used for the spoons are biodegradable. The designer is Lenka Czereova. Mapz – Utilizating 3 separate apps (available on Windows 7 phone) and a belt of sorts, Mapz aims to use crowdsourcing to add information to a database and to make full use of smartphones and tablets. The video on the company’s website indicates that this software has potential, but this seems to only have real benefit for English speakers at the moment. owNET -looks like it is still in a stealth mode. Prizeo – At the moment, this company’s website seems to be a work-in-progress, but the company’s Facebook page suggests that there’s quite a bit of buzz around it. The basic idea seems to be that celebrities will be able to use social-media campaigns to raise money for charity. TrashOut – Devoted to environmental consciousness, this particular site offers apps for iPhone, Android, and Windows Phone. Based in Australia, New Zealand, Czech Republic, and Slovakia, this app enables users to identify illegal trash sites and work to have them removed. The winner of this competition will be named on November 24th. The winner will be offered a “knowledge tour” trip to a destination of their choosing, a service package from the competition’s partners (KPMG, Google, and Neulogy).